There is a very definite order and a holistic approach to successfully completing a design project. First, Beth interviews the client to discuss the scope of the project and to fully understand the expectations. For the homeowner, the project takes on a very customized and personal approach. For the builder, it is a more business-like approach, yet still customized and elegant, while always keeping marketability in mind. For new construction, it is essential to put together a proper, well-rounded team, including architect, interior architect/designer, and landscape architect. The group works together, thinking through every detail of the project. Beth can either help in the selection and recommendation of the proper team, or is happy to work with the builder's or homeowner's choice. For renovation, Beth acts as the interior architect. If a major structural change is needed, then an architect will be consulted and often will submit the final drawings for permit. Beth measures the existing space and then retreats to her studio where she studies the dimensions. The client is presented with various options until satisfied with the final plan. Once the plan is set, the furniture and cabinet layout is designed. Only then can you properly place and design the electric plan. Then the construction selection phase begins, and after all the selections are finalized, the new construction or demolition begins. Overseeing the construction is critical to ensure proper execution of the design. 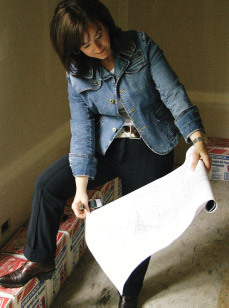 Beth routinely visits construction sites at each stage of the building process. To complete the project, Beth works with clients to select furniture, finishes, window treatments, etc.